Gen or Slash: Because I know the odds are good that someone will start getting excited part way through, I’ll just state right up front that tragically this story is not slash, pre-slash, nor is it in any way implying any sort of hot manly sexual relations in the past, present, or future between Starsky and Hutch. It's a Gen tale, folks. Not that there's anything wrong with that. Category: A spin-off from the tag to "A Death in a Different Place" (quoted below). Disclaimer: They ain't mine, sob! "Starsk, would you consider that, uh... a man who spends seventy-five percent of his time with another man, has got certain tendancies?" "Seventy-five... You mean, three quarters?" "Yeah. Sure, why not? You mean that was the case between John and..."
"No. No, that's the case between you and me." "Well, figure it out. In a five day week, about eighty waking hours, right?" "We work, eat, and drink about twelve of those hours, right? That's sixty hours a week, seventy-five percent of the time, and you're not even a good kisser." Hutch pressed the phone closer to his cheek and dropped his voice as he answered. "He's higher than a kite, Captain." His eyes remained fixed on the subject of their discussion, who at the moment was draped bonelessly over the couch, staring at his fingers as if he'd never seen them before. There was a pause, during which Dobey's concerned rumble vibrated in his ear. He gave the words only a fraction of his attention. Starsky was moving again, swinging his legs off the cushions, his face furrowed in worried concentration. "No, I don't think he needs a hospital. He's a little bruised, but it's nothing requiring medical attention... I gotta go, okay?" Hutch hung up the phone. In a few quick strides he was at his partner's side. Starsky had pushed himself up into a sitting position, leaning forward. Hutch dropped to his knees in front of him and caught him just as he overbalanced. A dark head landed on his shoulder and a hand grabbed his shirt and held on with a strength born of desperation. "Hutch..." Starsky's voice was frightened. "Hutch, they shot me up." Hutch gave up the attempt to muscle the solid weight of his partner back up onto the cushions. Getting him to bed would be the best idea, but it seemed an even less likely prospect at the moment than the couch. Dropping to the floor, he shoved the coffee table away with one foot and leaned back against the green fabric of the couch. As he pulled Starsky down next to him, he said, "I know. Can you tell me what they gave you?" He spoke with deliberate calm, trying to soothe the agitated man. It was a challenge to find a comfortable position in which to sit. Starsky seemed to have become a disorganized collection of disconnected limbs and awkward angles. Hutch grunted as an elbow caught him in the gut. Starsky didn't notice his partner's discomfort. He said, "Dunno. I never felt anything like this before. Not even in 'Nam." His anxiety was clear. "Why'd they do it, Hutch?" Hutch shook his head, too preoccupied to answer. He was attempting to get Starsky turned around so that he was leaning against his chest. Hopefully, the potential for further damage would be contained if Starsky could settle down comfortably. He felt a twinge in his lower back and winced, thinking that he was going to pay for this in the morning. When it became clear that no response would be forthcoming from Hutch, Starsky answered his own question. "Guess they thought it was funny. Shoot up a cop..." He paused, and then added defiantly, "Joke's on them, though. I don't feel so bad." "Glad to hear it," said Hutch, moving his face out of Starsky's hair. He let go of his partner for a moment, to scrub the itch off of his nose, and then he wrapped his arms back around the other man's chest. Starsky was quiet for several minutes and Hutch tried to relax, listening to the rain beating down on the glass of the patio door. They'd been undercover at a club, and somehow Starsky's cover had been blown. It had taken Hutch an hour to find him, during which time Starsky had acquired a black eye, bruised ribs, and an intimate acquaintance with the latest designer drug cocktail. At least it wasn't heroin. Hutch wasn't sure he could have been quite so calm, if it had been. The fact that they'd held his partner down and used a needle on him had been bad enough. Starsky shifted restlessly, his fingers plucking at the sleeve of Hutch's shirt. "I'm a little wired," he said. "I bet some pot would bring me down, take the red edges off'a things." Hutch choked. "You're asking me for pot? What, you've been using it a lot lately?" Of all the ideas he would have expected his partner to come up with, easing the effects of one illicit drug with another was not among them. "'Course not!" said Starsky indignantly, his hands still traveling, exploring the textures of Hutch's denim jeans, his cotton shirt, and the carpet. Anything within reach was fair game. Hutch leaned forward to scratch his knee, and got another face full of dark curly hair. He sneezed. Rubbing his nose with the heel of his hand, Hutch asked indistinctly, "Then how do you know pot would bring you down?" "Used it in Nam, a'course." Starsky's tone indicated his disbelief that Hutch hadn't figured out the obvious already. "Wouldn't touch it now. M'a cop. A dam' fine one." He paused. "Oh." He twisted in Hutch's grip, trying to look back over his shoulder at his partner. "Hey, Hutch?" "I've changed my mind. I don't want any pot. I gotta keep m'self pure, ya know?" Hutch suppressed a smile, and said, "That's good." He tipped his head back on the edge of the couch, avoiding Starsky's eyes. The blue of his friend's irises had all but disappeared, swallowed up by the yawning black of his dilated pupils. "Are you proud of me?" asked Starsky, the worry back in his voice. "'Cause, I'm proud of you, you know." Hutch had an uncomfortable suspicion that this was a conversation with a lot of potential to devolve into, "love ya, man." He was in no mood at the moment for drunken, or drugged, declarations of sentiment, so he said, "Relax. Can you sleep?" He knew it was a dumb question. Whatever drug it was that Starsky had been given, it was making him even more hyperactive than usual; his senses heightened and his emotions ricocheting from one end of the spectrum to the other. Starsky obediently closed his eyes and tried to lay still. Hutch could feel the contained energy vibrating through his partner's body. Outside a gust of wind spattered the rain against the patio door, beating a tattoo. It was dark outside and there was nothing to see but the water running down the glass, reflecting the light from inside. He heard a car pass on the road, a swelling shush of sound, quickly swallowed by the rain. He felt almost as if the world outside had retreated behind a silver curtain, leaving only himself and Starsky. The body in his arms twisted, and before Hutch knew what had happened, his nose collided painfully with Starsky's as his partner spontaneously kissed him full on the mouth. Shocked, Hutch jerked his head back, hitting the couch behind him. "Starsky?" A pair of hands landed on his chest, as Starsky tried to shove himself away from Hutch. "Oh, God." Hutch grabbed his forearms, preventing his escape. Surprise and astonishment wrung a laugh from him, as he said, "Starsky, what the hell was that?" Starsky's eyes were wide and panicked. Hutch couldn't help thinking that a person could disappear into those pupils. Starsky stuttered an incoherent reply. "I--I love you. I shouldn't... I mean, you'll have to get a new partner. Before I corrupt you." Hutch could feel fine tremors running through his friend's body, as Starsky tried to free himself from his grasp. "Oh, for cryin' out loud..." Hutch cut himself off. It looked as if he wasn't going to be able to avoid some variation on the 'love ya, man' scene after all. Pulling the tense body back into his arms, he said, affectionately, "Dummy." "B-but Hutch!" wailed Starsky, aghast. "Didn't you hear me? I said I love you!" "I love you, too. Moron." Hutch adjusted his position, maintaining a firm grip on his friend. His hands and his voice conveyed reassurance and comfort. Starsky tipped his head back to look at Hutch with a puzzled frown. "Aren't you worried? I might... uh, attack you, or something." Hutch swallowed another laugh. Drugged or not, Starsky was reasonably lucid at the moment and he deserved to be taken seriously. "I want to ask you some questions," said Hutch. "And you've got to answer me honestly, okay?" "What kind of questions?" asked Starsky. His voice was hesitant, as he said, "O-okay." "The first one's most important," said Hutch. He waited a moment until he was sure he had Starsky's full attention, and then asked. "Do you want what I got?" "What?" It took a moment for comprehension to dawn, and then Starsky said in a shocked voice, "Yuck!" Hutch snorted, thinking how very much like a seven year old his partner had sounded at that moment. "Next question. Do I turn you on?" He already knew the answer to this one. Whatever the hell that kiss had been, it had not been a lover's kiss. "No..." There was a long thoughtful pause. "But I think you're pretty." With considerable forbearance, Hutch said, "Starsky, get your hand off my hair." The hand was snatched back immediately. "Sorry." "But, but, I kissed you!" protested Starsky. "Yep." Hutch glanced up at the ceiling and prayed for patience. "And I liked it!" Starsky's expression was stricken. "Starsky, what were you feeling just before you kissed me?" "Before?" Starsky paused, trying to remember. "I dunno..." he said, slowly. "I just felt nice. All relaxed. Safe. It's raining and I can hear it on the roof." Hutch felt Starsky relax, his voice deepening and slowing as his scattered emotions shifted from panic into reflection. Starsky said, "When I was a little kid I used to get scared of storms like this, and Ma would have to sit with me just... like..."
Hutch felt the shock travel through Starsky's entire body; realization hitting him with electric force. "Hutch!" exclaimed Starsky. "You remind me of my Ma! That's why I kissed you!" Before Hutch could react, Starsky sat up and grabbed his face. He kissed him once more, mashing his lips against Hutch's enthusiastically. Hutch's head snapped back as he was released. His respite was only temporary, however. Starsky's back slammed into his chest, his friend throwing himself back down onto him with all of the abandon of someone flinging themselves into a beanbag chair. Hutch grunted painfully, feeling entirely abused. Joyfully, Starsky said, "I'm not queer!" Rubbing his forearm across his mouth, Hutch bit back an irritable 'I wouldn't say that', and instead said, "Glad we got that sorted out. Now relax, okay?" But Starsky was on a roll, his joy and relief compounding the stimulant effects of the drug in his system. "You're like Ma in so many ways. You want me to eat my vegetables, and you nag me about my clothes. You're patient, too. Even when you get mad at me, I know you're not really mad." Hutch could feel his masculinity shriveling up and dying with every word. "Starsky, if you don't shut up I'm going to have to gag you." "Ma used to threaten to hang me by my toes over the freeway," said Starsky, contentedly. "I think I can see why," said Hutch. "Go to sleep." Obediently, Starsky closed his eyes. Hutch looked down at the curly head in his arms, listened to the rain outside, and for a moment felt his exasperation give way to warm affection. Here we go again, thought Hutch, resignedly. The rain clouds had rolled away, leaving the city new-washed and glittering in the morning sun. Hutch brought a plate of eggs out of the kitchen and handed it to Starsky, who was sitting on the couch. Starsky looked at his breakfast with dismay. Hutch ignored the greenish cast to his friend's complexion with a vindictive sense of entitlement. It wasn't Starsky's fault that those goons had shot him up in the first place, but that didn't change the fact that Hutch had been the one who'd had to sit up with him, soothing his anxiety and talking him through the convoluted logical snarls his chemically impaired mind had kept coming up with all night long. "Hutch?" asked Starsky, gingerly placing the plate on the coffee table in front of him. "Yeah, buddy?" Hutch settled down into the chair next to the couch. "Did I...?" Starsky paused, uncertainly. "I didn't... I didn't do anything to embarrass myself last night, did I?" Nervously, he retrieved his coffee mug, and stared into it, only to discover that it was empty. "You mean, besides telling me I remind you of your mother?" Starsky gave him a shocked look. "Oh. Oh man, I'm sorry." "That's okay, you were out of your head," said Hutch, generously. He rose and snagged the cup out of Starsky's hands. "Here, I'll get you some more coffee." He could feel Starsky's bewildered eyes following him back to the kitchen, no doubt trying to figure out how his short, dark Jewish mother could ever have anything in common with his tall, Nordic, and blond partner. Unseen, Hutch grinned to himself. 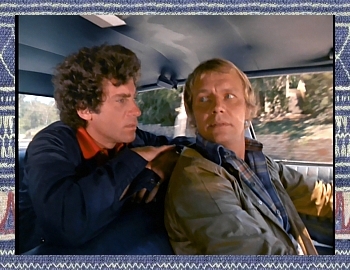 Maybe some day he'd tell Starsky exactly what had happened, but until then he intended to get as much amusement out of it as humanly possible. "...and you're not even a good kisser." "I can't believe you forgot." "What? Hutch? Forgot what? What are you talking about? Why are you laughing? Hutch? Hutch!"